Almost ten years to the day after a terrible car accident whilst he was studying at Sheffield Hallam University, David is about to embark on his new life…..with the help of AKA. David’s story is one of joy after many years of frustration. Following his accident in his early twenties, and under the care of a different case manager, upon discharge from hospital, David went to live with his Mum. Then following some unsuccessful placements, David was placed at a nursing home in a crisis situation. It was intended to be a short term placement but David remained at the home for almost four years. He was the youngest resident by some 40 years and there was little specialist rehabilitation or care available to him. He felt abandoned and isolated with what appeared to be no chance of the situation changing positively for him in any way. Unsurprisingly this had a terrible effect on him, creating huge depression and resulting in him absconding from the residential home, getting involved in heavy drinking and other attempts to ‘escape’ this regime. 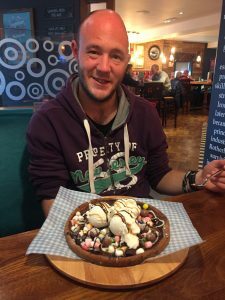 Although he had the help and assistance of a fantastic support worker in Dave, his goals were not defined, his future looked pretty static and he was becoming an increasingly frustrated young man. When AKA took over his case management we knew the budget was really limited, and we had to try and make the very most of all the resources available to us. We started to work on some planning and practical skills with David’s Occupational Therapist, building up to cooking, washing and shopping. Happy afternoons in Starbucks, Headway bowling evenings and walking football have been just a few of the activities we have been able to get David involved in, to get him out of the residential home setting to mingle with people his own age with similar experiences. He is particularly proud of his bus pass, plus one! David has loved his time with Rotherham Football Club which has made fantastic efforts to include him and others in their activities programme for bocca and walking football. David says he is a great defender and in spite of the fact he is an avid ‘Wednesday’ fan, he loves to play and attend at Rotherham. The one thing that has really arisen out of all this support and focused activities is the imminent change in David’s living arrangements. AKA sourced and secured a shared lives placement through the Avalon Group. David is going to live with care and support provider Anita, her family and another client. This weekend marks David’s first stay with his new family in Doncaster. To say he is excited would be understating the position somewhat! His life is about to be transformed and we are so proud of the work that David, Dave and his AKA team have put in to make that happen. A true triumph out of despair. We hope to keep you posted as David’s journey towards new independence continues.